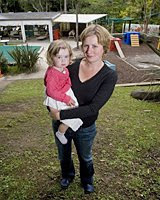 Louise MacLeod with her 2-year-old daughter Alice at Titirangi Kindergarten. Parents say they will pull their children out of a Waitakere City kindergarten to keep them away from "killer rays" if a planned electrical substation is built next door. Louise MacLeod is among the parents of 90 children at Titirangi Kindergarten who are protesting against Vector's plans to build a substation 30m from the centre, which is attended by children aged 3 to 5. Mrs MacLeod, whose son attends the kindy, says many parents are planning to take their children out of the centre if the station is built because of health risks. She pointed to a study by the stakeholder advisory group ELF-EMFs (electromagnetic frequencies) carried out last year, which looked into the effects on people of electromagnetic frequencies. "Research has shown that high levels of radiation have links to childhood leukaemia," Mrs MacLeod said. "They [Vector] have said the electromagnetic frequencies is like having an iron on. A full substation? No. "Nobody is going to be an idiot and put their child there." The report, which was written to advise the British Government on policies relating to electromagnetic frequencies and health, showed that high exposure had links to various illnesses, including childhood cancers, adult leukaemia and miscarriage. "In New Zealand you can live under a pylon and it's okay. But it's not okay," Mrs MacLeod said. "You don't put pylons or substations near a school. I'm just staggered by [Vector]. I just can't believe how stupid they are." Waitakere ward councillor Paul Mitchell acknowledged that the site was designated for Vector in the early 1980s. The kindergarten was established in 1973. "I'm no expert on rays and magnetic forces and things - I don't think anyone knew about that back then - but it's certainly a concern." Mr Mitchell said the city council was working closely with Vector to find an alternative site. "The community doesn't want it there and I tend to agree. If they can get it out of the town centre, that would be good, but it's proving difficult." Head teacher Amy Drinnan said she and her staff were unable to comment on behalf of the kindergarten, but as a member of the community, she was "gutted". Links with EMF levels and child cancers were what was most alarming, Miss Drinnan said. "There was a big case in Massey a few years ago linking EMF with child cancer. We will stop at nothing [because] it's kiddies involved and it's sickening. It's children's health here." In 2002, Cameron Duncan was diagnosed with cancer. He died the next year, aged 17. His mother, Sharon, says she still believes that a nearby electrical substation and a pylon at Cameron's old primary schools in Massey, West Auckland, were a key factor in his death. "There was a pylon down on the field. There was a substation right behind his second school. That substation will fire out EMFs and you'll get a couple of melanomas, a couple of cancers and deaths. Why do we need them to be built so close to younger bodies? Next to a kindy? There's plenty of bush out there - stick it out there." Five neighbours and at least five of Cameron's schoolmates were diagnosed with various cancers, which had led to deaths and serious health problems among others, Ms Duncan said. "Linesmen have installed powerlines and said to me, 'Yep, they definitely throw out EMFs.' Killer rays, that's what they call them." A Vector representative confirmed that a substation was being planned at the 515 South Titirangi Rd site, but said 16 alternative sites were being considered because of the concern within the community. "We are doing our best to take account of these concerns and Vector's objective to provide a reliable and safe supply of energy to the area." I was asked to write something in support of the residents of Leyland (UK), who are campaigning against the installation of Wifi in the town centre. I am pasting in what I wrote. It explains in laypersons' terms, how living cells depend heavily on electricity, carried in the form of ions, and how this makes them susceptible to damage by electromagnetic fields without the need to to generate significant heat. The underlying mechanisms of ion-flow can be found in any good modern biochemistry text book. All I have done is to simplify them for the benefit of the local council and their supporters. Please feel free to pass it on to anyone who might be in a similar situation. For example, our cells use the energy from food to pump ions out of mitochondria (the cells' power stations). They are then let back in through an ATPase (an enzyme not unlike a molecular water wheel). Each turn of the wheel generates a molecule of ATP, which is the main energy currency of the cell. In effect, an electric current flowing into and out of these tiny structures provides virtually all of our bodily energy. These Seattle residents have everything to be concerned about (cellular antennas, West Seattle Herald, Oct. 22). I live in a neighbourhood in Vancouver, B.C., where I am surrounded by three buildings with antennas on them and I have become electrohypersensitive because of the antennas. My sleep is fragmented and disturbed, I have vertigo, constant ringing in my ears, warm in the extremities. Make no mistake, the radiation from wireless antennas and WiFi is highly biologically active. My family doctor has confirmed he has other patients living close to antennas that have also become ill. Governments and the wireless industry will do nothing to protect you as their revenues are in the billions - the Canadian government pocketed a cool C$4.25 billion last June from the auction for the 3G frequency spectrum. Current safety limits, which only address thermal effects (heating of tissue) are woefully inadequate and do not address non-thermal effects such as DNA damage, and leakage in the blood-brain barrier and electrohypersensitivity. There are numerous studies indicating that electrohypersensitivity and cancer clusters are consistent with living in close proximity to antennas. Do your research - check out www.mastsanity.org. It seems that the incidence of brain tumors is increasing among the rich and famous. Could this be related to the fact that they have probably been using cell phones longer than persons in the general population? Golf great Seve Ballesteros has been fighting a brain tumor for weeks, trying to treat it in time to save his life. Thus far, Ballesteros has undergone surgeries and treatments to detect the brain tumor and get it out. Now it seems doctors have finally been able to diagnose Ballesteros' brain tumor as oligoastrocytoma, which will need to be completely taken out in another operation. Oligoastrocytoma is a cancerous brain tumor that attacks the brain and spinal cord's nerve cells. The oligoastrocytoma tumor caused Ballesteros to collapse in an airport on October 6, as he has been treated for the tumor ever since. A surgery on October 16 took out a large part of Ballesteros's oligoastrocytoma tumor, but parts are left in a deep portion of the brain. A new surgery on Friday will be needed to take out those remaining sections, and to relieve the swelling and bleeding in Ballesteros's brain. Oligoastrocytoma is a rare case of brain cancer that can cause headaches, seizures and changes in the motor system. It can be treated, but chemotherapy and radiation treatments will still be needed afterwards. But a surgery to remove oligoastrocytoma does not guarantee that the condition will not recur. Young adults are more likely to get the disease, although Ballesteros is in his 50's. But that works against him as the prognosis is more dangerous for those in later years. Survival time is relative in cases of oligoastrocytoma, so it will likely not be known for a while if Ballesteros is in any immediate danger. But those with oligoastrocytoma have a better than average chance of living more than 5 years, with a 25% of more chance of living past 10 years. The oligoastrocytoma tumor is rated on a scale of one to four on how dangerous it is. The grade of Ballesteros's tumor is unknown and was not revealed by the hospital. The surgery needed to remove the remaining oligoastrocytoma from the brain is reported to be "very complex" and difficult. Ballesteros is still in stable condition as preparations begin. MADRID, Spain (AP)—Seve Ballesteros was in stable condition Wednesday after the 51-year-old golf great had surgery on a brain tumor a day earlier. La Paz hospital said were no complications from the surgery. Spanish state news agency Efe reported the operation lasted 12 hours. The hospital said a sizable part of the Spaniard's tumor was removed. It was not immediately known if it was malignant and it would be several days before the results were announced. "At the moment he is conscious and stable, although he will not be able to receive any visitors in the coming days until he has recovered from the surgical process," the hospital said in a statement. The hospital said Ballesteros was in the intensive care unit. It said there would be no further statements about him until he is moved from the unit, most likely next week. Ballesteros, winner of three British Opens and two Masters, briefly lost consciousness and was admitted Oct. 6 to the hospital, where the tumor was discovered. On Monday, he acknowledged having a tumor and said he faced the "hardest challenge of my life." Ballesteros, who won a record 50 tournament on the European tour, retired last year because of a long history of back pain and has since concentrated on golf course design. Ballesteros transformed European golf. When the Ryder Cup was expanded to include continental Europe in 1979, Ballesteros helped beat the United States in 1985 to begin two decades of dominance. He also captained Europe to victory in 1997 at Valderrama, Spain. Ballesteros and Jose Maria Olazabal of Spain are the most formidable partnership in Ryder Cup history, with 11 wins, two losses and two halves. This news article is actually a year old, but it is still of great significance - the next big liability action! Lloyd's of London is preparing for the next big liability action — for personal injury damages based on the use of cell phone technology. "Mobile phones are now so ingrained in our daily lives that the thought of living without them is impossible," Lloyd's notes in a posting on its Web site. "Commercially and personally, mobile technology has revolutionized the way in which we live. "So what would happen if, say in 20 years time, the link between the electromagnetic fields (EMF) generated by mobiles is proven to be linked with a higher susceptibility to illness? How are London's underwriters protecting themselves from opening the floodgates to future claims without prejudicing policyholders?" Lloyd's says the number of reports on mobile telecommunications and its impact on health is "immense," and "the study findings are often conflicting." Jon Upshall, the director of casualty broking for Aon Global, which specializes on the telecom and media sectors, added: "There is ongoing debate as to whether there is a causational link between EMF emissions and leukemia, with the present weight of scientific evidence suggesting there is no correlation." Still, notes Guy Malyon, head of casualty broking for Aon Global, there remains a possibility that a link could be proven. "The concern is that it could be the next big thing," he says. "In the U.S., there is also the risk that U.S. plaintiff lawyers could use the class action rules there to pursue EMF related actions in the way that they have tried previously with tobacco and other perceived health hazards. A similar thing could happen with mobile phones." "Who knows, they could be forced to put warnings on the phones to prevent lawsuits in the future," he added. Malyon said underwriters assess the possible impact by being industry specific and assessing the risks accordingly. "There are markets that will write telecoms liability cover which provides express coverage for bodily injury and property damage due to EMF exposure and there are those that won't," he observed. "Each side will get all the information coming through. It is hard to prove that the closer you are to an electric pylon the more damage it causes." The real injustice of the cell tower deal between Verizon and the Apostolic Church, on Harris and D. St., came to light to us while watching the city council meeting on public access television a couple weeks ago. I was aghast at the tepid response that most council members had toward residents' concerns and disappointed at their rush to approve this project. Even though we live a half a block from, and in plain view of, the 60 foot cell tower "to be", we were never notified by the city during the permitting process. Even more disheartening: it was our neighbor, who we are friendly with, who brokered the deal with Verizon behind our backs. Something smells fishy in Eureka, and it's not from the high tide. A glance at a cell tower locator map of Eureka on the Internet will reveal seven towers surrounding the city, most in commercial/industrial zones. This cell tower would be the first one in the center of town in a primarily residential neighborhood. I think this precedent is significant and warrants more attention than a few mailed notices to residents within a 300 foot radius of the proposed site. This past week, we walked around our neighborhood and talked to people about the project. Most people never received notice of the cell tower and were outraged that they were left out of the dialog. What kind of city do we live in where hard working, tax paying citizens, are denied a real voice in decisions that will directly affect our lives? This injustice must be undone now. The strange thing about the next story is that I know persons who are electro hypersensitive, who do not use a cell phone, are not exposed to nickel, yet when they are sensing electro magnetic exposure above normal levels, they break out with the same type of rash. Doctors should not be so baffled. If they only learned to listen to their patients, they would realize that exposure to electro magnetic radiation causes dermatitis and a host of other illnesses. LONDON - Doctors baffled by an unexplained rash on people's ears or cheeks should be on alert for a skin allergy caused by too much mobile phone use, the British Association of Dermatologists said on Thursday. Safety concerns over mobile phones have grown as more people rely on them for everyday communication, although the evidence to date has given the technology a clean bill of health when it comes to serious conditions like brain cancer. "In mobile phone dermatitis, the rash would typically occur on the cheek or ear, depending on where the metal part of the phone comes into contact with the skin," the group said in a statement. "The jury is still out'. This is a common quote that is used by the world press when discussing cell phone safety, but it is misleading. Cell phones use microwave radiation, and research clearly shows that microwave radiation is extremely dangerous, causes cancer and poses other harm to human health. The health effects of microwave radiation have been studied for much longer and more extensively than cell phones. Any discussion about cell phones and their potential health risks would be greatly lacking if the writer did not examine vast quantity of scientific research about the health effects of microwave radiation. By narrowing the discussion to cell phones only, which have been used and studied for a relatively short amount of time, the press are failing to identify the dangers that are already known about microwave radiation. Microwave illness and the health effects of microwave radiation must be carefully considered when cellphone health risks are discussed by scientists and the press! Almost everyone who uses a cellphone probably has a secret worry: Is it safe to place a small radio transmitter right next to my brain? The most exhaustive study to date investigating whether mobile phones pose any risk is nearing completion, but the research, under way for almost eight years, may not settle the question. The study, known as Interphone and organized by the International Agency for Research on Cancer, a United Nations watchdog, has investigated rates of four cancers found in the head and neck area in cellphone users from 13 countries, including Canada, for clues on whether the technology is dangerous. The verdict: There is a hint in the data that cellphones may cause an elevated rate of brain tumours for long-term users of 10 years or more. But it isn't clear whether the effect is real or the result of a design flaw in the study. The researchers - about 50 from the various countries - have been arguing for the past 18 months over what the findings mean and how to explain them to the public. About one-third of the researchers are convinced there is a risk from using cellphones, about one-third give the devices a clean bill of health, and the remainder fall between the opposing camps, according to Louis Slesin, editor of Microwave News, a New York-based publication that tracks research into the biological effects of radio waves. The study's lead author, Canadian epidemiologist Elisabeth Cardis, says the researchers have been trying to resolve their differences of interpretation and deal with the complexity of their findings, which are based on the study of about 6,400 cellphone users with cancer. She said the study is almost ready to be submitted to a peer-reviewed science journal, but couldn't offer a date when it would be made public. "At this point, I don't know whether there is a real risk or not," said Prof. Cardis, who is based at the Centre for Research in Environmental Epidemiology in Barcelona and is an affiliated scientist at the University of Ottawa. "It's extremely important that we find out ... the correct answer, which is why we've spent a lot of time [on this] over the last year and a half." With an estimated 3.3 billion cellphones in use worldwide, including many owned by teenagers and children - who may be more susceptible to cancer-causing agents - settling whether cellphones are safe has become an urgent public health priority. But cellphone users can be forgiven for being a tad confused. In May, the Toronto Public Health department recommended that children, especially preteens, use land lines whenever possible and limit the use of cellphones, contending that the safety of the phones has not been proven. Yet other respected bodies dismiss such concerns. Health Canada says "there is currently no convincing evidence" cellphones cause serious health effects, such as cancer, according to its Web posting on the issue. Public attention on the possible cellphone-cancer link also rises when prominent people, such as U.S. Senator Edward Kennedy, are diagnosed with brain tumours. He has a type of cancer that is being investigated in the Interphone study. With experts so divided, there were hopes the Interphone study would lay the safety debate to rest. The study, which began in earnest in 2000, is looking at four cancers that could have a connection to cellphones because they are found close to where radio waves from the devices would be absorbed in the body. They are: glioma, an often fatal type of brain tumour (and the same kind that has stricken Mr. Kennedy); meningioma, a slow-growing, often benign, brain tumour; acoustic neurinoma, a cancer found in the inner-ear area; and salivary gland tumours. These cancers are uncommon, so if there is any link to cellphones, the number of cases being caused by technology would be low. Breast-cancer incidence, for example, is about 16 times higher than brain tumours among Canadian women. Because the cancers under investigation are rare, the researchers looked at rates across more than a dozen countries - including Japan, German, Britain and Australia - to get results that offered more chances of finding an effect. The Canadian arm studied people with the cancers living in the Ottawa, Montreal and Vancouver areas. Those with cancer were compared with controls: people who use the devices but don't have the disease, to determine whether there was any link. When the results from the British and Nordic countries were pooled, researchers found "a significantly increased risk" of both glioma and acoustic neurinoma related to mobile phone use on the side of the head where the tumour developed, according to a study update posted on the IARC website earlier this month. The Israeli wing of the study has found a "possible relation" between heavy cellphone use and salivary gland tumours in the parotid gland, it said. But Prof. Cardis said the risks may be overstated for technical reasons as a result of the study's design. One problem is that people who have recently been shocked by a cancer diagnosis may not be accurately reporting their cellphone usage. There have also been lower rates of participation in the control group. Both factors might skew the results to make cellphones appear more dangerous. But raising more potential concern are the Interphone findings that corroborate recent data from Sweden, one of the first countries to adopt cellphones in a big way, in 1981. Researchers there are also finding elevated rates among long- term users - about double for both glioma and acoustic neurinoma after 10 years of use. A researcher with the Swedish studies, Lennart Hardell, professor of oncology at University Hospital in Orebro, says that in light of his findings, he recommends people "reduce exposure as much as possible - use hands-free" settings on their cellphones. "The evidence that we have on the phones at this point is worrisome," says Devra Davis, head of the University of Pittsburgh's Centre for Environmental Oncology. But not all experts are as worried. One of the Canadian Interphone researchers, Daniel Krewski, a professor at the University of Ottawa, doesn't try to minimize his exposure to cellphones. "I'm personally not taking any extra precautions," he says. Because it is now unlikely that Interphone, one of the biggest and most expensive cellphone studies - about $15-million - will settle the safety question, Prof. Davis says there may be an easy way to figure out if there is any hazard: by running a study comparing people's cellphone billings with their medical records. If industry billing records were made available, then researchers "would have the answer in a few years." Cellphones emit a type of energy known as radio-frequency waves. Up until the development of cellphones, many researchers weren't worried about them. They have been considered benign because they are much less powerful than ionizing radiation, the type produced by X-rays: radiation so energy-laden it's able to break chemical bonds and cause damage to genetic material. Exposure to it is unequivocally linked to cancer. With radio waves being much less powerful, their worst effect has been the ability to cause things to heat up, much like a very weak microwave oven. The Canadian regulatory exposure limit to energy from portable radio transmitters in cellphones is a maximum of 1.6 watts per kilogram. It's equivalent to a small amount of heating that can't be perceived by those using the devices.But in recent years, there has been mounting evidence that radio waves pack a biological punch. According to Daniel Krewski of the University of Ottawa, radio-frequency radiation can influence the rate at which elements such as calcium and sodium cross cell membranes. It's also able to change the production rates of an important enzyme, ODC, or ornithine decarboxylase which is involved in regulating cell growth, among other effects. But Prof. Krewski says that while biological activity of radio-frequency radiation is now considered proven, it's "not of known health significance." Because the energy of radio waves drops off rapidly with distance, those worried about cellphones can reduce their exposure by using hands-free modes or ear pieces, reducing call lengths or using a land line. Cellphone towers also give off radio-frequency radiation, but because of their greater distance from people, the exposure is much smaller than transmissions from phones themselves. Professor Olle Johansson was kind enough to draft the attached letter to the Economist in response to their recent article on ES published on 27th September 2008. The letter has been held confidentially until this point to give the Economist time to publish any update. This document provides the reader with a very useful summary of how ES is approached and considered in Sweden. This letter carries new information that may be circulated and added to web sites. With many thanks to Olle Johansson for his continued good humour and kind assistance. Este martes por la mañana, los empleados que habían sentido dolores de cabeza se sentían mucho mejor que en la víspera: desaparición de los dolores de cabeza, sensación de respirar mejor. Sin embargo, no se había llevado a cabo todavía ningún tipo de tratamiento especial del aire. A nice place to: (develop cancer and serious health problems). Here is another story about political stupidity. The citizens of Cambridge, Ontario are paying $30-million for a new city hall which the Mayor describes as 'the finest, most eco friendly, energy efficient municipal hall in Canada'. The story then goes on to say - The building is a WiFi hot spot and has a computer kiosk with educational resources. All the good work that has gone into building this eco friendly structure has been undone by installing a WiFi system that will continually radiate the workers and visitors with cancer causing microwave radiation. During the building process why did they not install a 'safe' wired internet system? Surely someone on council, or working for the council, or someone involved in the building of this premise, has heard about the many adverse health effects of microwave radiation (www.bioinitiative.org) ? Why would these people endanger the lives of so many people by using a highly dangerous new technology that is not nearly as efficient as wired internet? During the past summer I visited downtown Cambridge for a shopping trip. I was only in town for about two hours but the ambient radiation levels caused me to suffer chest pains. Thankfully these stopped as I left the city. How much worse does microwave radiation have to get, before those in charge, are forced to take responsibility and ensure a safer electro magnetic environment for their citizens and their visitors? Property Report: INSTITUTIONAL: MUNICIPAL BUILDINGS. The Globe and Mail. CAMBRIDGE, ONT. -- The ancient Athenians called it the agora. A meeting place. A civic space, where people would gather to discuss the comings and goings of life, surrounded by government buildings and mercantile shops. Before this year, if you walked any of the streets along the Grand River in downtown Cambridge, you'd have found the small and scenic Southern Ontario city got most of it right. Victorian-era shops and restaurants with limestone facades dot the downtown core. An old, former city hall stands stoically near a historical fire hall with aging red brick. And churches and schools, some converted from old factories that wouldn't look out of place in a sunnier Dickens' London, line the streets along the river. But city hall? It was tucked away in a dull grey building, away from the city's core, after several municipalities formed the City of Cambridge in 1973. And the civic square, the central location where the city would hold events? It didn't really exist. "We were renting for 35 years, and it became very evident we needed to do something on a more permanent basis," says Doug Craig, the city's mayor. On a recent morning, Mr. Craig sits in the fruits - perhaps "shrubbery" is more accurate - of the city's labour: a $30-million, 85,000-square-foot building that opened in June after about two years of construction. In August, the building received a gold certification in the Leadership in Energy and Environmental Design (LEED) program from the Canada Green Building Council. It incorporates a variety of energy-saving methods, from collecting rain water in a 10,000-litre cistern and using it to flush toilets, to taking advantage of natural light with enormous windows. "At a time when people are environmentally conscious, I think we've answered the bell on that one," Mr. Craig says. "This is going to be the finest, most eco-friendly, energy-efficient municipal hall in Canada, so we've set the example of what can be done with buildings." The new city hall may be the largest capital project in the city's history, but officials estimate the city will cut its energy costs about 42 per cent relative to a typical building this size. That translates to roughly $160,000 a year, or $1.6-million over 10 years, in savings. But there's more to it than that, says Don Smith, the city's chief administrative officer and committee chairman for the project. "It gives a signal to people in the investment community ... that the city is serious and wanting to revitalize its core area," he says. "There are a couple hundred people in this building that buy goods and services downtown [and] support the market, and so it has some very practical and immediate economic spinoffs. "And of course," Mr. Smith adds, "it brings people into the core. Other people come down here to do business and they get the opportunity to see what a beautiful downtown we have." The new city hall on Dickson Street links the old city hall, the farmer's market, the old fire station, a seniors' centre and an arts centre via a series of pathways. It sits tucked behind the new agora in Cambridge: a civic square that the mayor says will be used for city festivities and ceremonies. When you walk into building, you immediately notice - and hear - its atrium centrepiece: a 110-metre wall of tropical plants with a trickling waterfall. The building has more than 3,000 plants in offices, the foyer and rooftop, which builders say cleanses the air of pollutants and re-circulates clean air throughout it. "As you walk out of here," Mr. Craig says with a laugh, "the toxins will have left your body." Other Canadian municipalities with aging infrastructure may want to take note of what Cambridge has done - in particular, how the city melded historical buildings with a modern one. "With the advice of our architects, what we were interested in doing was not trying to duplicate a heritage building," Mr. Smith says. "It was important that there be some contrast between the old and the new." Rick Haldenby was one of those architects. He's director of the University of Waterloo's School of Architecture, which is situated on the Grand River in Cambridge, in a building that once housed a silk mill. "I'm a tremendous believer in preserving architectural heritage and re-using historic buildings," he says. "... I'm also a believer in the principle that it's important that heritage buildings, especially great, high-quality heritage buildings, contribute to the contemporary life of the city." Contemporary architecture, Prof. Haldenby says, should co-exist and mutually reinforce historical heritage. And a municipal building shouldn't be a stolid expanse of concrete; it should create civic pride among citizens. "We were really careful to try to make a building that wasn't a big display of pyrotechnics itself," he says. "It was a building that was careful about where it sat and careful about its deference to its historical neighbours." A 110-metre wall of plants, complete with trickling waterfall, purifies the air and re-circulates clean air throughout the building. Part of the roof will contain a number plants and shrubs. The building itself has about 3,000 plants spread throughout. The building is a WiFi hot spot and has a computer kiosk with educational resources. To encourage exercise, the staircases are visible, in the middle of the lobby, and more prominent than the elevators. "People will use them if they see them," Mayor Doug Craig says. Seventy-five per cent of the building's daytime lighting is natural light. To help moderate the building's temperature, a weather station on the roof sends signals about temperature, barometer, wind direction and speed. Mobile telecom operators violate laws of the land. Madras High Court today issued notices to the Centre, the Telecommunication Regulatory Authority of India (TRAI), BSNL and private cellular operators on a petition seeking a direction to stop erection of communication towers atop buildings in populated areas.A Division Bench, comprising Chief Justice A K Ganguly and Justice F M Ibrahim Kalifulla, ordered notices returnable by three weeks. In his public interest litigation petition, "Traffic" K R Ramaswamy submitted that the telecom towers of over 20 feet height erected by mobile operators atop many old and new buildings in thickly populated areas were not designed to withstand the forces of nature. "If these towers fall down it will certainly take hundreds of life. The towers also emit electromagnetic and microwave radiation causing very serious health hazards, including brain tumours, nervous disorders and cancer," he claimed. "I submit that these mobile telecom operators violate laws of the land, including violation of the fundamental rights of a citizen to live in a healthy environment," he contended. In the first story, a Vancouver City Councillor thinks that a massive WiFi system in the city is not going to cost the city anything. It is a pity that he has not done his homework and looked at the health effects of microwave radiation. If he thinks that illness and cancer will not have a significant cost on City residents, he is very mistaken. This narrow minded, short sighted view of WiFi technology is likely to cause significant costs in the future. Roughly 8,000 businesses and residents along Vancouver's Main Street corridor will have free access to wireless Internet by December, when the installation of the first of three mesh Wi-Fi networks in Vancouver is completed. The deployment of the network, which runs north along Main Street from 57th Avenue to Cordova Street in downtown Vancouver, is the first phase in what could one day be a citywide wireless cloud. Delta-based Novax Industries Corp. is laying the Wi-Fi mesh network over a transit signal priority (TSP) system it's installing on Main Street as part of a contract it was awarded last February by TransLink, the Lower Mainland's transit authority. Transit buses equipped with wireless beacons can remotely access the TSP system to activate or prolong green lights to ensure consistent flow of the Main Street transit line. Novax has been developing audible pedestrian signals, traffic light synchronizing systems and other traffic control systems – it's the incumbent supplier of Vancouver's roughly 700 traffic light controllers – since its founding in 1981. Now, Novax's traffic control systems are going wireless, and the company is pitching the systems as a platform for municipalities to build unified, multiple-use wireless networks. Within a citywide cloud, citizens could access the Internet, and business and government could remotely operate a host of services, including buses, security systems and telephone networks. "If you take a look at where this might go, you start off with transit vehicles, then you can decide to go into emergency vehicles, then you can track commercial vehicle operations through your network," said David Atnikov, Novax's president and CEO. TransLink plans to also deploy TSP systems along Hastings Street and Broadway. In its request for proposals for the Main Street TSP system, TransLink said that additional TSP systems in the city will be based on the technology used on Main Street – making Novax a front-runner for being awarded contracts for TransLink's future TSP systems. Novax said that its technology could produce wireless networks that cover 15,000 and 8,000 businesses and residences along Broadway and Hastings Street, respectively. City councillor and mayoral candidate Peter Ladner confirmed that Vancouver's community wireless broadband initiative has been derailed because the city couldn't develop a business model that included a consistent revenue stream that would offset costs to taxpayers. Novax's contract with TransLink is achieving the initiative's goal of offering free wireless access to the public. "We are going to get Wi-Fi after all, and TransLink is going to pay for it," said Ladner. "It's not going cost the city and … the spinoff is that now there is broadband available along the route for other uses potentially." Some of those opposing a citywide municipal network have pointed out that there are already at least 200 free wireless "hotspots" in cafés, coffee shops, malls and other public-use spaces around Vancouver. While municipal Wi-Fi networks still face many security and regulatory issues, as well as resistance from wireless service providers in the private sector who fear losing business, some Canadian cities such as Fredericton and Toronto have created low-cost or free wireless networks that encompass downtown districts or café hubs. Steveston Harbour in Richmond deployed a wireless mesh network last month to operate a network of 22 surveillance cameras. The wireless technology connects the security systems of the harbour's two separate sites, which are located about two kilometres from each other. Although the harbour has no immediate plans to use the network for other applications, the harbour's operations supervisor Joel Baziuk recognizes the opportunities the network provides. "We could provide wireless Internet access for all of our clients if we wanted to," he said, noting that the company could also operate speakers, microphones and electronic gates via the network. "The idea is to give yourself a whole bunch of doors that you may not open yet, but can open any time you want." He said that the harbour isn't concerned about security breaches over the wireless network because the network is on a limited-access frequency. A spate of spurious stories on cell phone cancer risks that were in the news last week need to be aired and corrected. They also provide yet another reason to get the Interphone study out as soon as possible. MOBILE phones DO increase the risk of brain cancer, scientists claimed yesterday. The chances of developing a malignant tumour are "significantly increased" for people who use a mobile for ten years. The shock finding is the result of the biggest ever study by the International Agency for Research on Cancer, part of the World Health Organisation. Scientists found a type of brain tumour called glioma is more likely in long-term mobile users. French experts analysed data from 13 countries, including Britain. They cross-referenced various types of tumours with mobile use. Researchers admit the cause is unknown, but it is thought radiation from handsets could be the trigger. Study chief Professor Elisabeth Cardis said: "To underestimate the risk would be a complete disaster." Last night a British expert insisted mobiles are not dangerous. Professor Patricia McKinney of the University of Leeds said: "Reasonable use is unlikely to increase the risk of tumours." "Even the average human brain is remarkable," Helen Phillips writes in the New Scientist. "In adults, it has perhaps 100 billion neurons, each connected to its neighbours by 5,000 synapses or so. A brain can make and break a million new connections each second. It can store information for more than a century if you live that long, automatically cataloguing, refiling and editing as needed. It can reconstruct our surroundings using a range of sensors that sample vibration, electromagnetic radiation, chemicals and pressure, and prioritize in milliseconds what might be of interest or concern. It co-ordinates at least 640 muscles and looks after the essentials of energy generation, reproduction and survival with little thought, freeing our minds to socialize, ponder the meaning of our existence and learn from our experiences and those of people whom we may never have met."